New local label has begun to get rolling. Back in April, they released Ex_Tension’s Freedom and on August 30 their inaugural compilation, These Sounds Will Have to Meet Somewhere in Between will see the light of day. 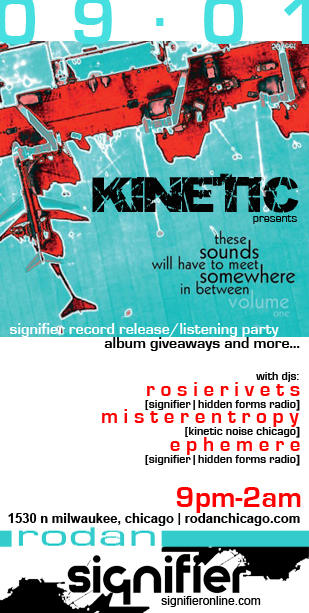 To celebrate Kinetic will host a listening/release party September 1 at Rodan featuring MisterEntropy and Signifier/Hidden Forms Radio collaborators rosierivits and ephemere. Eat, drink, and soak up spectacular beats! Go here for TSWHTM details and sound samples.